In Carroll Kemp, winemaker, and Greg Adams, viticulturist, we have found true journey companions. Their talent and profound familiarity with the nuances and complexities of winegrowing within the West Sonoma Coast, their entrepreneurial advice, an attention to detail, a long-term outlook and most importantly, a shared philosophy of a “vineyard first” approach to winegrowing have created a “working chemistry”, a blend if you will, that has been instrumental in realizing our vision. This connection extends beyond the professional realm and we are now fortunate enough to count them amongst our true friends at a personal level. We first met Carroll four years ago when our children were in the same kindergarten class in Healdsburg. In addition to sharing a passion for our kids´ school community and serving in the board together, we quickly learned that we also shared a love for farming and winegrowing, specifically along the extreme cool-climate hilltops of the West Sonoma Coast. Carroll had already started his own wine label back in 2000 (Red Car Wine) and has been working with vineyards in this region for over a decade. Throughout Carroll’s experience, he has used viticulture and transparent winemaking to craft Pinot Noir, Chardonnay and Syrah of character and originality that faithfully express the cool climate personality of the Sonoma Coast. It was a natural fit to work with Carroll as our consulting winemaker. We met Greg in the very beginning stages of Alma Fria’s journey when we first began work on our recently purchased Holtermann Vineyard in Annapolis back in 2012. Greg has been working in the viticulture and enology world for the last 25 years and in addition to collaborating with Alma Fria, he works with our neighbors and friends: Patz and Hall, Lynmar, Red Car, Freeman Winery, Baker Lane Vineyards as well as his own label, Gregory James Wines. Greg has been instrumental in walking the vineyards side by side with us, truly helping us care for the land. We shared the philosophy that working very deeply with the soil and its microbiological life is the basis for establishing and creating vine health. “When Jan approached me that he wanted to start a wine brand and asked me if I wanted to help him with it, it was easy to say yes. First, it was because I wanted to be around Jan. Next, it was because he took the long-term point of view from day one, by making his first step to purchase a vineyard. It was always vineyard first. This was the philosophy I held with Red Car from the beginning, so it was easy to connect with Jan. Culture drives wine styles and preferences much more than we imagine. It seems to require at least a century of wine production before nature is allowed to assert more influence than man on the same. Making wine that speaks more of place than people requires one to get outside of the powerful influence of our youthful California history. Indeed, it requires one to get outside of one’s self. So to me winemaking is more about listening than doing. From the moment I met Jan, I knew he was a kindred spirit. The soul of the vineyards and the way that nature connects all of us; he has been putting that in the bottle. That is exactly how I think about wine and about life”. – CK, October 2015. “For the last twenty give years, I have worked in the wine industry because of the people and the lifestyle that it celebrates. I spent over six years living in South America, which gave me fluency in Spanish and this is something that allows me to connect with Jan, not only at the language level, but the shared Latin American perspective. Growing fruit on the edge of its cultivatable possibility of viticulture is always something I have been attracted to. There is no doubt that the varietal expressions in these regions are undeniably distinctive from the more inland regions. Growing fruit in this area is not for the faint of heart and it requires conviction and belief that the ultimate product will be worth its struggles. This is something that I have carried with me throughout my career and its always refreshing to find someone to share that passion with. Jan is the one of the few individuals that I have had the pleasure to work with in my career that understands the importance of personal relationships and the relationship to the land. It is a perspective that reminds me of families that I know in the great grape growing regions in Europe that have a multi-generational perspective. Jan is planning for his grandchildren and I am proud to be a part of this soulful journey”. – GA, October 2015. 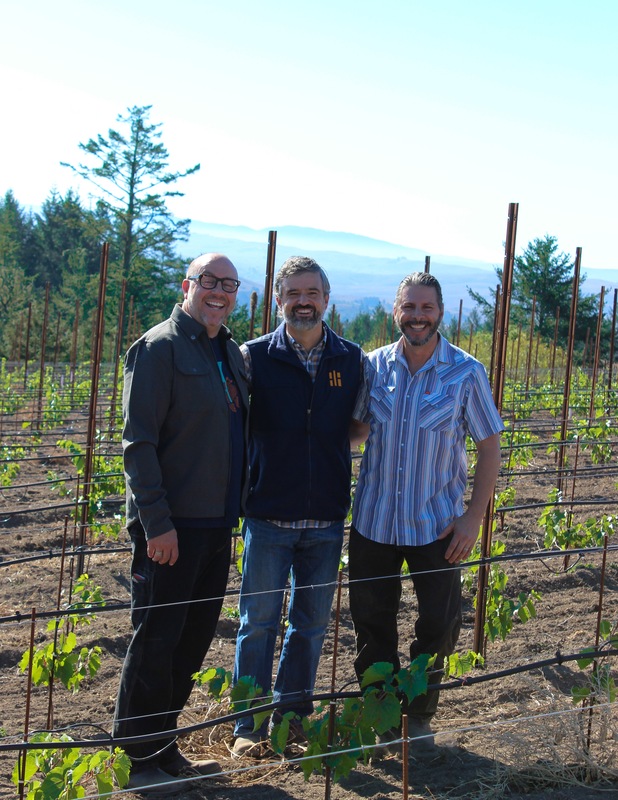 Carroll (l), Jan (c) and Greg (r) at Alma Fria´s new vineyard development in Taylor Lane, Occidental, CA.